You know what, they keep telling us that Superman is an alien from the planet Krypton but we have our suspicions. Yeah, we think it may have something to do with his amazing cape! His alter ego Clark Kent never wears a cape and is a total wuss. Then let the guy jump into a phone booth to toss a cape around his neck and boring ole Clark suddenly is flying around faster than a speeding bullet! Hmmm... yea definitely has something to do with that cape. To get to the bottom of this we would like to test this cape theory out. If you'd like to take the chance at possibly having your kiddo transform into a being as powerful as Superman then you can help. You see, we have these officially licensed Superman Capes. They look and feel, we've even been told they smell, like the real deal! 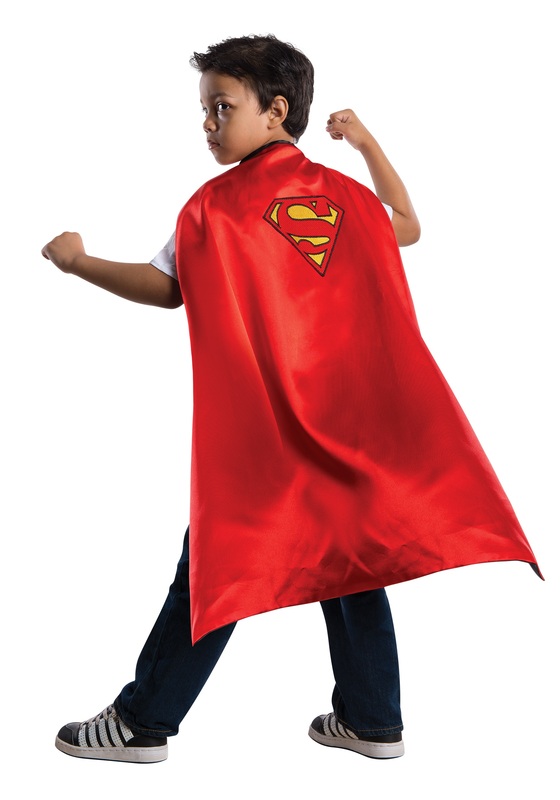 So all you need to do is grab one of these fine looking capes for your youngster and let us know if they start to develop any superhuman abilities. If they do, then we're right! If not, then your little one still has a pretty awesome cape to complete an amazing Superman costume! Pretty much a win-win sort of deal for you here.